After months on end of crushing on this darling, affordable little bar cart, I finally made it mine. From the first time I laid my eyes on this beauty at Target, I would check the website religiously, nearly every week, to see if it was still available. Last Thursday was one of those days where I stalked it and decided in a post-holiday-blues kind of moment that it would be the perfect addition to our dining room. Besides, after the Christmas décor comes down, a home looks so bare. Wouldn't you agree? This was the perfect consolation to the holidays ending before I was ready. Although it wasn't available online, I found that it was able at several Targets in the Atlanta area. So, I reserved it, purchased it online and picked it up within a few hours at my local Target. Target will email or text you when your order is ready for pick up so there's none of your time wasted hanging out at the Guest Services counter. Done and done! So without further adieu, here she is. I can't wait to style her up pretty! She's even more stunning in person! Stay tuned for before and after pics. Ahh I've been eyeing this! It's so pretty and finally, one that's classic yet affordable. Can't wait to see how you style it! 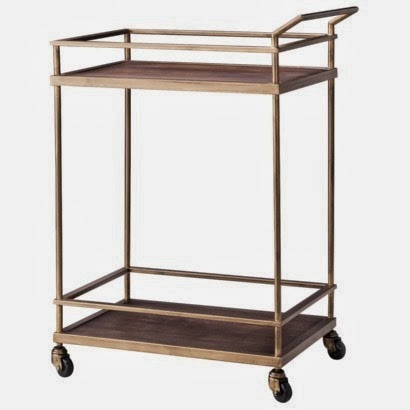 I bought a bar cart at Marshalls a few years ago and it is one piece that I will always love! I love to arrange our "spirits" ...add some glassware, cute napkins and fun straws and you're set. Can't wait to see how you style it!